The original five members of the Druid Peak pack — #38 and #39, the alpha male and female, and female pups #40, #41, and #42 — were captured near Fort St. John in British Columbia and relocated to Yellowstone’s acclimation pens before being released in April 1996 in the Park’s scenic Lamar Valley. The nearly treeless Lamar Valley is often considered Yellowstone’s most prized hunting grounds, and the most visible wolf territory in the Park. On this public stage, the Druids displayed early signs of the upheaval and drama that would eventually come to characterize the group. During that first year in Yellowstone, a yearling male, #31, dispersed from the nearby Chief Joseph pack and joined the group, while alpha female #39 left the pack completely to become a lone wolf — perhaps driven off by #40, her own ruthless daughter, who began a terrible reign as the pack’s alpha female. In 1997, pups were born to #41 and #42, the subordinate females, but none to the aggressive alpha female, #40. Lone wolf #39 reunited with the pack briefly, then left once again in November — this time with her daughter, #41 (who also may have been driven off by #40). The pack’s two males, #31 and #38 were shot and killed in December, setting the stage for the dominance of a new male, #21, dispersed from the Rose Creek Pack. By the end of 1998, the Lamar Valley Druids had seven members, and a growing reputation for conflict. The constant harassment of beta female #42 by her sister, #40, earned #42 the nickname “Cinderella” by the Yellowstone researchers. The put-upon Cinderella created a den and gave birth to pups in 1998, but none survived; the following year #40 attacked #42 in her den, and she again produced no offspring. Cinderella finally reached the ball in 2000, after a violent turn of events that put her at the head of the pack. She and the other female members of the pack, perhaps tired of #40’s iron-pawed leadership, turned on the alpha female, and killed her. At least three litters were born to the liberated females; 20 of the 21 survived. The Druids, 27 strong, became the largest pack in Yellowstone. In 2001, another 10 pups were added to the group, and the 37-member Druid pack became perhaps the largest wolf pack ever documented. Like all dynasties, however, the Druids were destined for a fall. In 2002, the massive pack reached critical mass, and splintered. Three new packs, the Agate Creek, Geode Creek, and Slough Creek packs, were created, each anchored by a former Druid female born at the same den in Lamar Valley in 1997. The Druids were left with 11 members by 2002’s end, including the matriarch, Cinderella, and the long-time alpha male, #21. The pack expanded to 17 members by the end of 2003, aided by the arrival of a lone black male, #302, formerly of the Leopold pack. #302 may have fathered all of the pups not born to the alpha female. To wolf researchers, he was “Casanova” — a lover, not a fighter, who wooed the females in the group while staying appropriately submissive to alpha male, #21. In 2004, the Druids once again suffered terrible losses; longtime alpha female #42 was killed by members of a rival pack, and the aging patriarch was found dead in the summer. At the same time, however, the neighboring Slough Creek pack began to spend more time on the northwestern boundary of Druid territory. Their incursions into Druid turf culminated in a decisive battle in 2005 that ousted the formerly dominant Druid wolves from the Lamar Valley. Two adult female Druids died that year — one killed by the Sloughs — and no pups survived. 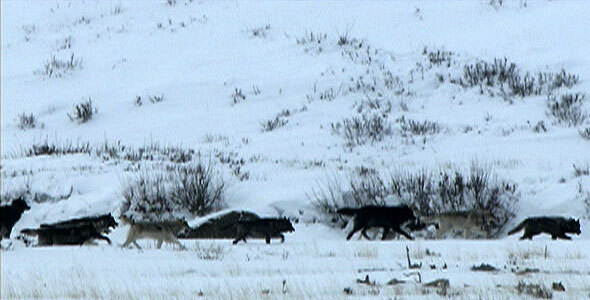 The pack was reduced to just four members, and looked to be nearing its end. In true soap opera fashion, however, the Druids’ epic tale does not conclude with their exile. In 2006, from their new location in an area called Cache Creek, aided by Casanova and #480, the new alpha male, the pack began to rebuild. 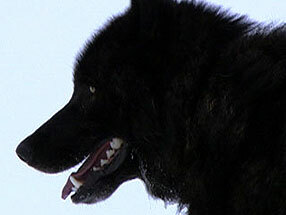 Both of the pack’s adult females successfully bred, producing eight surviving pups. The Druids pushed back against the Slough Creek pack — which suffered its own losses earlier in the year after a run-in with an unknown pack from the north — and reclaimed their traditional territory in the Soda Butte and Lamar Valleys; six pups were born there in 2007. The Druids, for now, are home.